Imagine this iconic scene from Westside Story: The Jets, clad in member’s only jackets and cuffed khakis are dance-fighting against rival gang the Sharks, who are looking lean and mean in leather and denim. Temperatures are flaring as the actors snap, twirl, and leap across the stage to the patter of bongos. Now imagine that two actors from opposite gangs have the hots for each other. That’s how Dana and Jenny Shaheen first met, during a 1990 performance of the midcentury musical presented by Pismo Light Opera. HAPPILY EVER AFTER? : Cinderella (Madison Shaheen) and her prince (George Gorrindo) will travel deep into forest foliage during Chameleon Productions’ presentation of 'Into The Woods' at the Clark Center July 31 through Aug. 15. The couple should have been careful what they wished for. Still in love and still in love with theater, Jenny and Dana are celebrating the 20th year of Chameleon Productions, the Arroyo Grande production company they started in 1995. Like all creative endeavors worth doing, it has been a massive joy and a royal pain. Over the course of two decades, the company has regularly put on one show a year with a few exceptions. Jenny said the shows themselves may be fleeting, but the memories are vivid and soul nourishing. 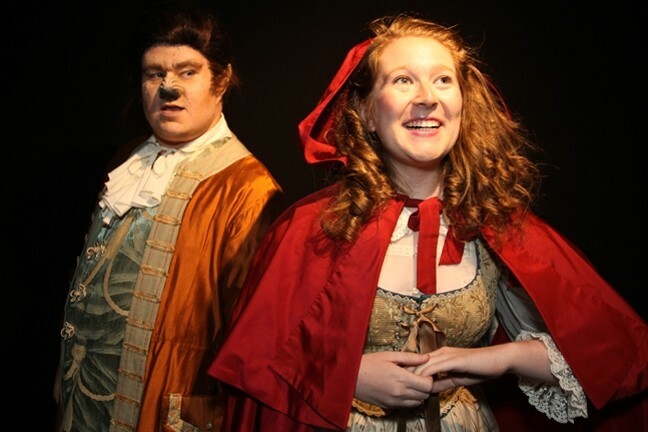 WHAT BIG ACTING CHOPS YOU HAVE : Little Red Riding Hood (Ashlin Hatch) and the Big Bad Wolf (Gary Borjan-Hernandez) will play cat-and-mouse during Chameleon Productions’ upcoming musical. “I’m always touched when people tell us what it’s meant to them to do our shows and to see the journeys our lives and the community have taken together,” she added. “People said we should have done Jesus Christ Superstar because that was the first show we ever did, but our daughters have been bugging us to do this story forever,” Jenny said. That’s right—the couple’s two daughters are also part of the show. A total cast of 19 round out the performance. Madison Shaheen will play Cinderella alongside her sister Ashley Moses, who will lend her talents behind the scenes. As for their parents, there’s a heck of a lot of exertion to be done without even stepping foot on stage. In 2002, the company presented the first musical ever performed on the Clark Center stage, which quickly became their home venue. In 2007, they built a 26-foot motorized turntable for their production of Jekyll & Hyde (they used it for last year’s successful run of Les Miserables). GO INTO THE WOODS: Learn more about Into the Woods at the Clark Center this summer by contacting Jenny Shaheen at 550-8610 or emailing ChameleonProd555@gmail.com. Thanks to a recent film adaptation featuring Meryl Streep, Into the Woods proved to be a hit at the box office. And, like any good fairy tale, it has a good moral: Be careful what you wish for. Humor, heart, and clever dialogue mesh with inventive songs that have kids and parents smiling together. Theater lovers Dana and Jenny Shaheen met on stage and married in 1993, starting Chameleon Productions, a local theatre company based in Arroyo Grande. Although each has a successful career outside of theater, their passion has provided audiences with high production value shows over the past 20 years. Chameleon Productions has seen some talent over two decades! Five Cities resident Leah Anderson, who was featured in the company’s 2006 production of Evita, is currently a lead actress at the world-renown Oregon Shakespeare Festival. North County resident Tabby Skanes, who appeared with her mother in the 2004 production of Sweeney Todd, went on to a National Tour of Little Women: The Musical and is now at the Great American Melodrama. San Luis Obispo resident Joe Ogren, who appeared in several Chameleon shows throughout the years, is currently doing a National Tour of the Tony winning musical Memphis and will soon be graduating with a BFA in Theater from Pace University. Hayley Thomas is playing it cool boy, real cool at hthomas@newtimesslo.com.